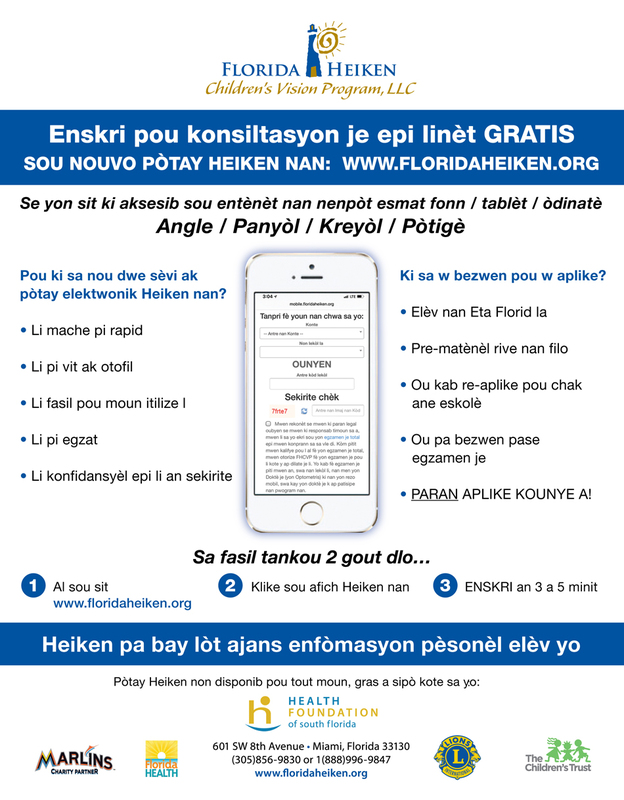 Click Here for printable paper consent form for Florida Heiken Children's Vision Program services. If you have lost a voucher please call 305-856-9830 for a replacement - at no cost to the family. Click here to read testimonials about our Heiken Program from school personnel. 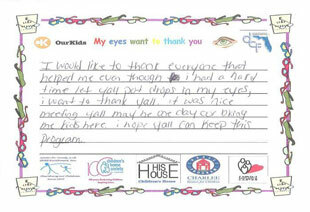 Our Florida Heiken Children's Vision Program has developed a Best Practices approach for the delivery of eye care to uninsured schoolchildren over the past 24 years as documented in Optometry: Journal of the American Optometric Association, January, 2012. To read the full text of this article, click here. Students with poor vision cannot see the board or do close work and fall behind in class. Our objective is to provide comprehensive eye health services including vision examinations, eyeglasses and vision training for students, thus meeting the goal for vision established in National Eye Institute, National Institutes of Health, Healthy Vision/Healthy People 2010 initiative. Our Heiken Program has received two Healthy Vision/Healthy People awards from NEI. The goal of the Florida Heiken Children's Vision Program is to assure that all financially disadvantaged schoolchildren who fail their vision screening have access to a comprehensive eye examination including dilation and glasses, if required, to ensure academic success. Following the Florida Statute which sets standards of care, the Program provides an eye examination with dilation so that underlying medical conditions can be diagnosed and appropriate medical referrals made. Glasses are prescribed if required. These free services are offered statewide either on-site at schools via four mobile eye clinics or by our network of over 1,200 participating optometrists. Of 11,146 low-income schoolchildren receiving a comprehensive eye exam during the 2016-2017 school year, 668 were referred for medical intervention for retinal tears, glaucoma and other eye abnormalities; 8,196 children received prescription glasses. 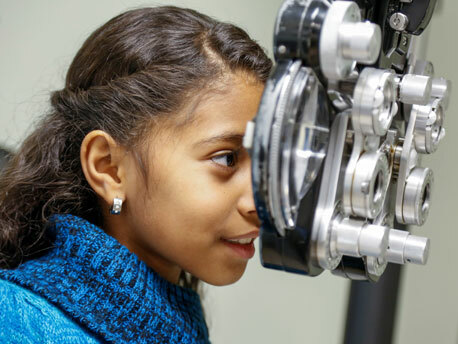 Approximately 84% of all children examined require and receive prescription eyeglasses, confirming the importance of a follow-up eye exam after a student fails the state-mandated vision screening. Miami Lighthouse for the Blind was a two-time Charity Partner of the Marlins Foundation in 2013 and 2014. 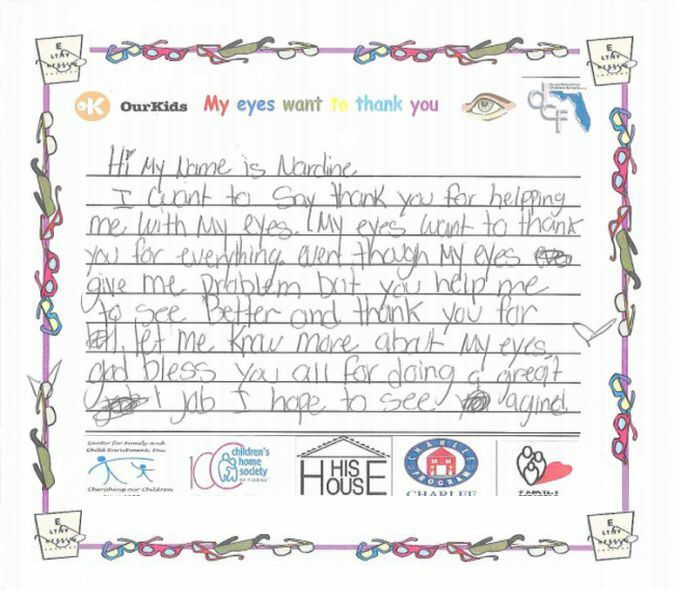 Donations from the team helped underwrite the cost of providing vision screenings, comprehensive eye exams and prescription glasses to underserved inner-city schoolchildren who receive eye care through our Florida Heiken Children's Vision Program. According to research by the American Optometric Association, vision problems in children and teenagers may contribute to poor school performance, behavior issues and delinquency. 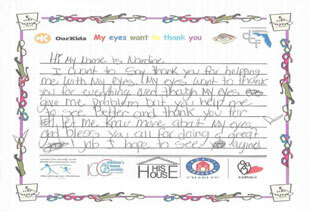 AOA research shows that 1-in-4 children has vision problems; literacy can be improved with early intervention. With corrective lenses, children are able to read their assignments, see the board, and learn to their fullest potential. Their prospects for succeeding in school improve immeasurably. 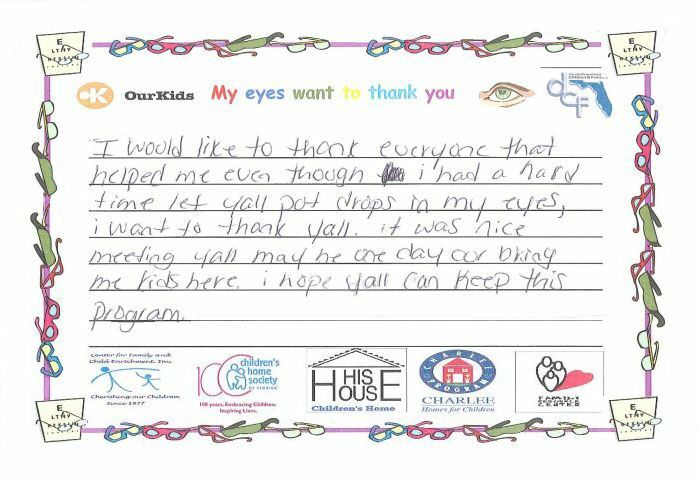 Of the 1,400 families contacted in our recent Heiken Children’s Vision Program market research survey, underwritten by the Health Foundation of South Florida, 74% of the respondents reported that their child had improved academically because of the services provided by our Program. Leveraging Florida Department of Health funds with funding from other entities such as the Florida Optometry Eye Health Fund, The Children’s Trust, the Miami Foundation, other private foundations and individual donors enables our Heiken Program to provide eye care for the growing number of children who need our services each year. 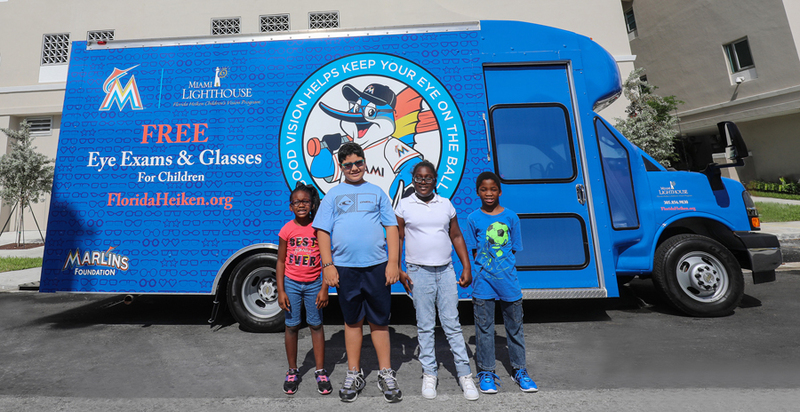 The Heiken Children’s Vision Fund was created in 1992 by the Dade County Optometric Association, and merged with the Miami Lighthouse in 2007. 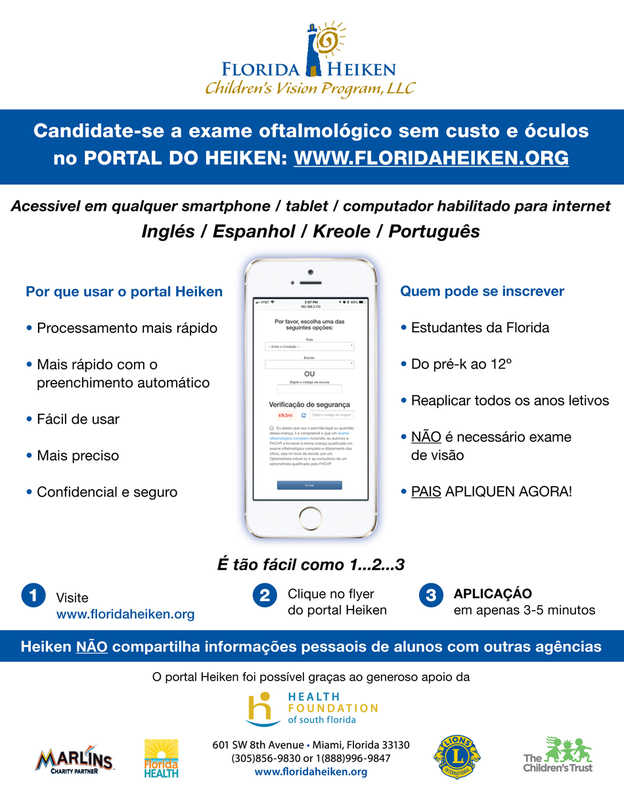 In 2010, the Florida Heiken Children’s Vision Program, LLC, a division of Miami Lighthouse for the Blind and Visually Impaired, Inc., was registered with the State of Florida, expanding vision health services to low-income children statewide. Governance oversight of the program is provided by the President, Secretary and Treasurer of the LLC; oversight of the program is provided by the Florida Heiken Children's Vision Program Advisory Committee comprised of optometrists, ophthalmologists and representatives from foundations and school districts. Click here to view the roster of Florida Heiken Children's Vision Program Advisory Committee members. Miami Lighthouse ranks among the elite 2% of U.S. nonprofits having earned eight consecutive 4-star ratings from Charity Navigator, the nation’s premier independent nonprofit evaluator. Receiving such a distinction reflects our sound fiscal management, responsible use of donor dollars, and financial strength. The Miami Lighthouse for the Blind and Visually Impaired Florida Heiken Children's Vision Program is partially funded by The Children’s Trust. The Children’s Trust is a dedicated source of revenue established by voter referendum to improve the lives of children and families in Miami-Dade County. Miami Lighthouse received the prestigious South Florida Business Journal 2011 Excellence in Health Care Award in the Community Outreach category at an award ceremony October 6. Click here for press release. School Board Member Raquel Regalado thanks Miami Lighthouse for the Blind and the Heiken Children's Vision Program that enables uninsured, financially disadvantaged children in Miami-Dade County to receive free comprehensive eye examinations and eyeglasses at no cost. Filmed at the Miami Lighthouse 80th Ruby Jubilee Dinner Concert at the Biltmore Hotel. 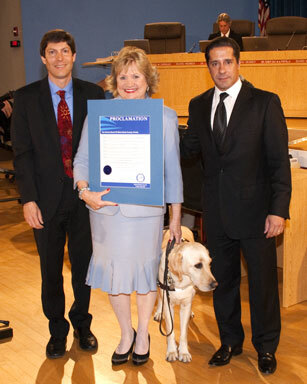 A proclamation recognizing the Miami Lighthouse Heiken Children's Vision Program for distinguished services to county schoolchildren was presented at the April 14th, 2010 meeting of the Miami-Dade County School Board. School Board member Dr. Martin Karp, Miami Lighthouse CEO Virginia Jacko, and Superintendent Alberto Carvalho. Click here to read the School Board Proclamation. Click here to read a letter of appreciation from Miami-Dade County Public Schools Assistant Superintendent, Ava G. Byrne. Click here to read Florida Senators and Representatives Visit the Florida Heiken Children's Vision Program Serving Children throughout the State. 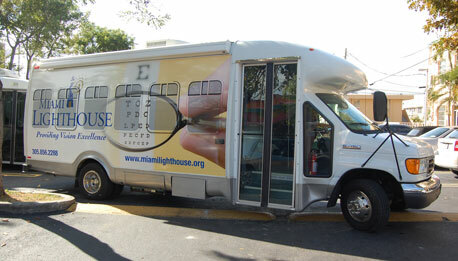 Miami Lighthouse for the Blind is committed to providing a fully accessible website experience.